Paris has its La Coupole café, which, like a funnel, gathered the all Parisian intellectuals, including Simone de Beauvoir and Jean-Paul Sartre. It has its Les Deux Magots, which regularly catered to Picasso, Ernest Hemingway, André (Jules?) Breton and Albert Camus. Saint Petersburg has its Le Literary Café, which was preferred by many classical Russian writers, including Nikolay Chernyshevsky and Fyodor Dostoyevsky, and which is considered to be the last place that Alexander Pushkin visited before being wounded in a duel. Vienna has its Café Central, which around 1913 became a key meeting place for Leon Trotsky, Vladimir Lenin, Josip Broz Tito, Adolf Hitler and Sigmund Freud. Although aforementioned cafes were established in the late 19th or early 20th century, nowadays also each European metropolis has its own favourite, almost legendary meeting places for intellectuals and creative individuals. Café Osiris was established exactly 20 years ago, in 1994, in the presence of George Soros, and was initially a sister institution for The Soros Foundation’s established academic bookshop the Aperto libro. For 20 years already the crossing of Lāčplēša street and Barona street has been looked over by the Eye of Osiris, located on the building’s rounded corner above the café’s entrance. This eye has also been a witness to what has happened behind this door – powerful brainstorming and births of some ambitious ideas. Some of them have been brought to life, some of them linger halfway and some of them have remained right there at the tables – in coffee grounds or in the last drop of vine. However, no doubt that during its two-decade existence, Café Osiris has been the birthplace of many successful collaborations, the results of which have echoed in Riga’s cultural life and elsewhere. New acquaintances and old friends have met here – Café Osiris is a place where most of the customers – politicians, artists, musicians, entrepreneurs and actors – know each other. It is a place where intellectual conversations alter with the most frenetic talks “outside the box” during late bohemian dinners. 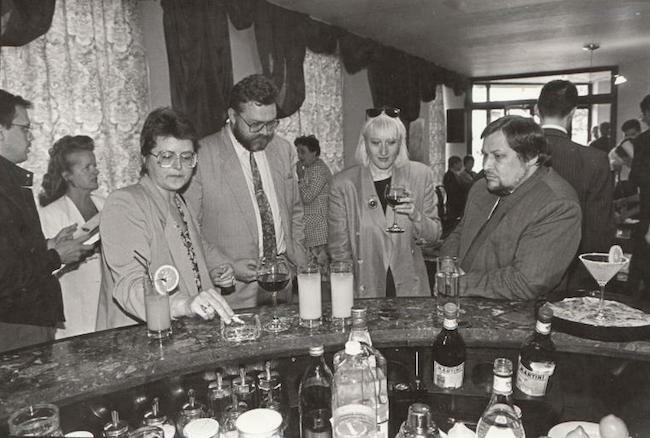 Those, who have visited the café once, return again and again, and become closer with Riga’s social life’s elite. The laconic interior of Café Osiris consisting of no more than ten tables was created by designers Varis Dzērve and Dace Zeltiņa. If we were to highlight some of the elements of the café’s interior, those would definitely be the green stone surfaces of the tables and the bar counter, as well as the glass fireplace with its candles which are lite up during autumn and winter evenings. 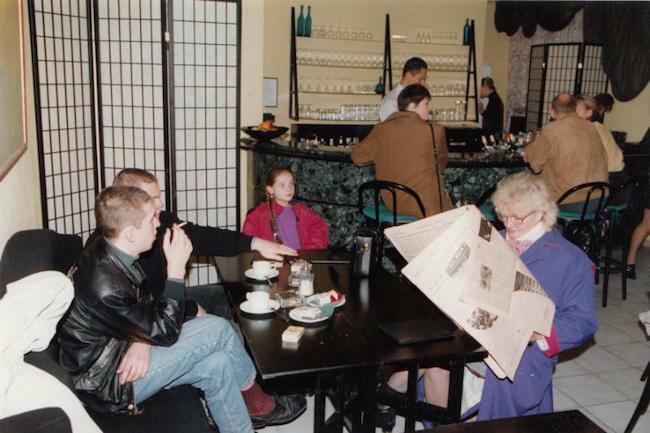 Besides, to this date café hasn’t changed almost anything in its interior. The only variable in its interior is the exposition of works of Latvian artists on the walls, which were at the beginning embellished with Latin inscriptions and have now been painted over. Change of exhibitions in Café Osiris usually happen spontaneously with an artistic approach. The café’s longest collaboration has been with the painter Ilmārs Blumbergs and the graphic artist Vilipsōns, whose works are now enhancing the café’s walls. I was involved in making of Café Osiris – I created the graphic design of its logo. And, of course, I have many different memories about this place. Back then I was an employee of The Soros Foundation and Café Osiris was closely related to it – it was the main gastronomical basis of this foundation. 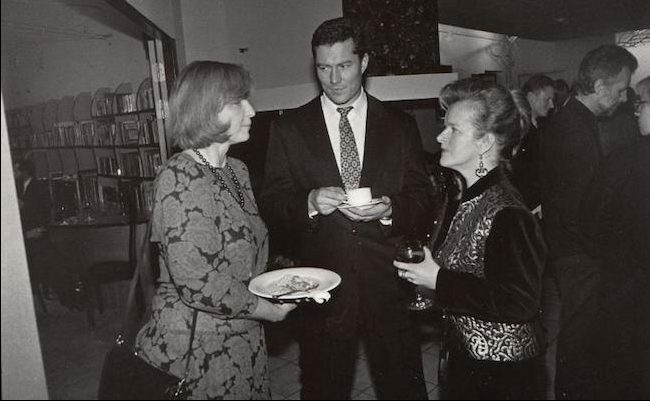 In the ‘90s The Soros Foundation was located on the second floor of the same building, therefore all receptions and other events took place in the café’s premises. George Soros also participated in the opening of the café, and it was a big and beautiful event. 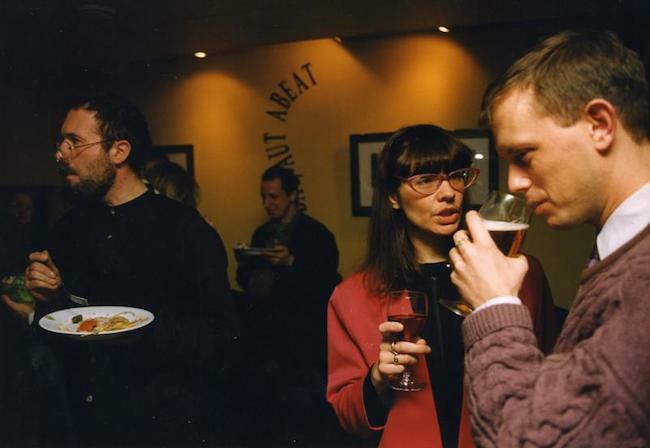 The idea about a café was expressed by Vita Matīss, Managing Director of the Soros Foundation Latvia; later the café’s management was assigned to the already successful restorator Andrejs Žagars. In the end they did not come to any conclusion, went away and never came back. I sometimes visit Café Osiris. The old spirit is maintained and preserved there. For me Café Osiris is every day! I admire this café for its longevity. In its 20 years of existence nothing much has changed. The interior is just as it was when I started to go there. We know a lot of cafés with “extra” interior that managed to survive only for half a year. At the bar counter, sitting on my chair [Vilipsōns’ favourite place at the farthest corner of the bar counter is marked with a metal tablet with his name on it] I have created many graphic and sculpture work sketches. Ninety-three percent of the illustrations of my book “Sumpurņa suneti” were drawn at the café’s bar counter. As you can see, Café Osiris has a significant meaning in my life, and I hope that it continues like that until crematory time comes. I mean – mine crematory time! I am Café Osiris’ client since the day it opened. It is my favourite place in Riga to go to for a cup of coffee or for dinner. It is spacious enough and at the same time a small place. The café has a great and unobtrusive music playlist and good food. The most important thing, of course, is the company. You can always meet acquaintances here – Café Osiris is for the “insiders”. 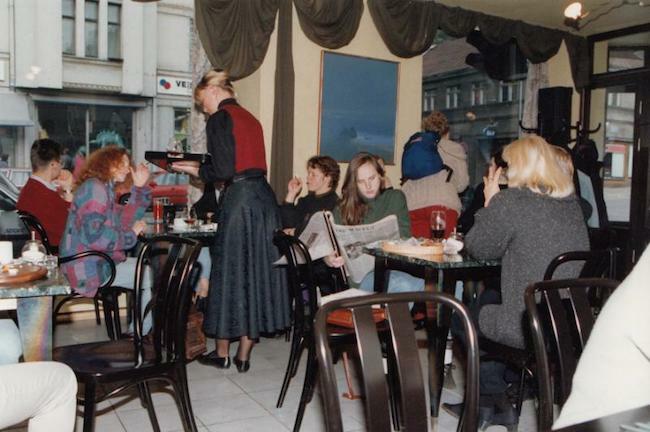 Riga has only two or three such places and Café Osiris is one of them, besides it is the only one with such a history. It is worth mentioning that the café’s staff have always been very friendly towards kids and have made them feel at home. And a whole new generation has grown up in this “home”. They are now the new customers. 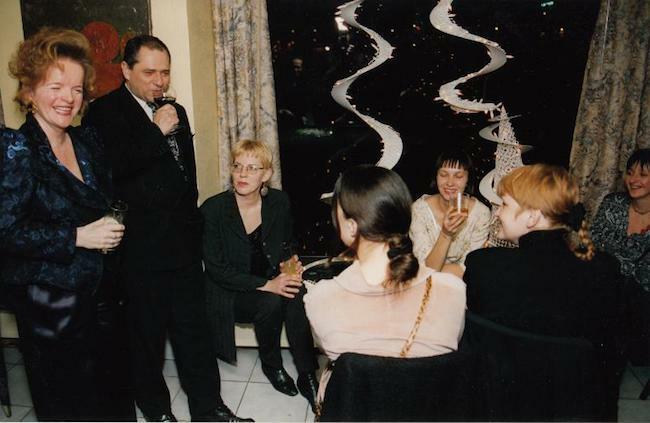 I still have some bright memories about the first years… there have been dances around the tables and on the tables – in wonderful after-show celebrations together with people that are now very prominent in Latvian society. There have been some great times there! It was also my fathers, Bruno Rubess, and Imants Ziedonis’ favourite meeting place. I remember that some waiter once told me that it was beautiful to see how these gentlemen had become slower and slower each year, but still came here, sat here and together made this world a better place. The main thing that I have to mention while going twenty years back in time, is Café Osiris’ revolutionary market entry. It happened thanks to Andrejs Žagars great enthusiasm, his ability to inspire, his love for travelling and tasting food; as well as Vita Matīss’ exceptionally high quality and style standards. Café Osiris won a significant place among Riga’s restaurants and cafés. 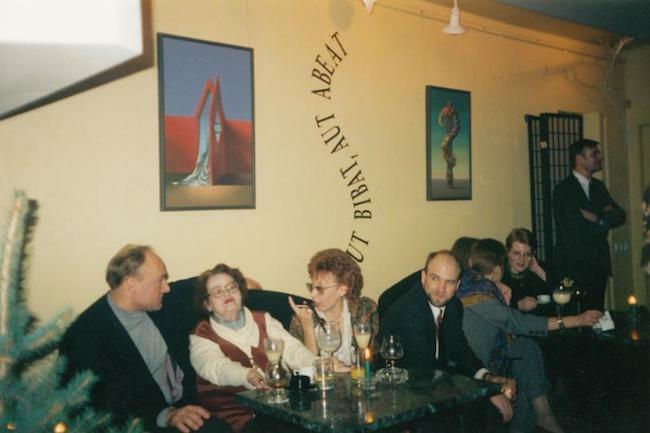 It is so amazing that many customers that came to the café 20 years ago, have remained loyal and still keep coming. I am one of them. Once, at the very beginning of my restaurant business carreer, I had a chance to work in Café Osiris and I still have only good memories about that time and teamwork. Many of this team have made various successful carreers, and it means, that this time was inspiring and exploratory. 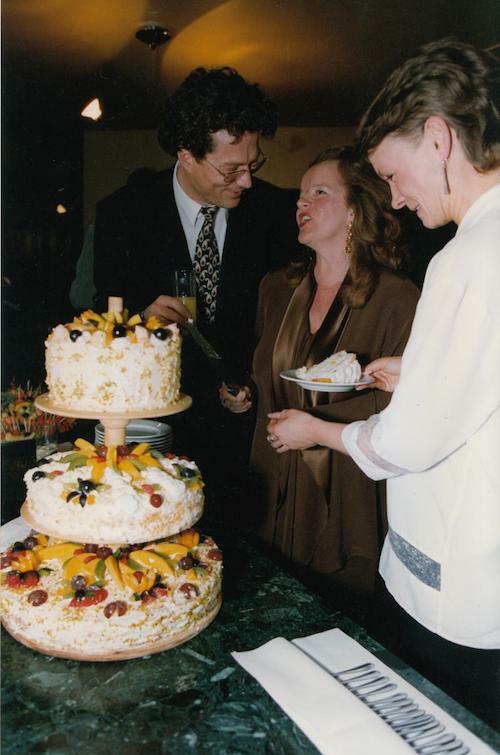 I remember that the evenings were frequently very long, because at the time when I worked there, we were a very happy team, and we never denied the guests who wanted to celebrate life and stay a little longer. There were times when we joined these celebrations. That atmosphere, which was created twenty years ago, still lingers in this café’s walls, just like the vivid memories about this experience in our minds. Cafè Osiris is the most significant restaurant in my life. I have no doubt about it. I go there for breakfast, most often – lunch, however, I like it there also in the evening. A big part of my social life takes place there, also a lot of my friends regularly go there. In the past I used to sit at the bar counter and have a cocktail. Later I started to prefer the first or the second table at the window – with the door view. Previously my drinks were vodka/bitter lemon, then Sangiovese red wine, now I have become more choosey and I often prefer a glass of water with lemon. Why is Café Osiris so special? I think it is because of the persons who created it – with their exquisite taste and view on the order of the things. Café Osiris has an unbelievably good interior – simple, without any pageantry, but very elegant. Every restaurant dreams about an interior that wouldn’t have been changed for twenty years and would still look great! Also – the artworks on the café’s walls – unobtrusive, unnoticeable, but just as an important part of the pleasure as the food, wine and the people around. Café Osiris has also very good music. A legend states that Vita Matīss herself chose it and supervised that it was played back correctly. My favourite thing on Café Osiris’ menu? Greek antipasto, though they don’t have it anymore. Or grape leaf roll with lamb. And the most important thing – the waiters and staff. The staff has changed over the years, but the essence has remained the same – they understand you right away and are always very friendly and responsive. I don’t know how they find Café Osiris (or the other way round), but they are the best in Riga!!! Cafè Osiris Osiris is somewhat part of my identity. I first walked into Café Osiris those 20 years ago. I was a boy of 19, who had recently come to Riga from countryside, and I was wearing a warm Alaskan jacket. 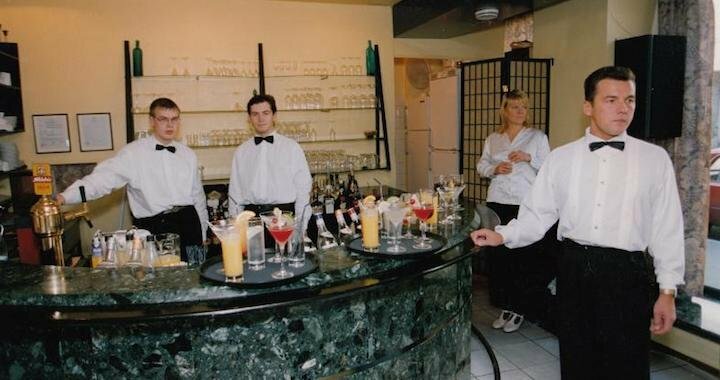 I sat down at the bar counter and I was thinking, how fancy everything looked here – people sitting with their backs straight, a bartender and bar assistants behind the counter… Back then that all was a complete mystery for me! 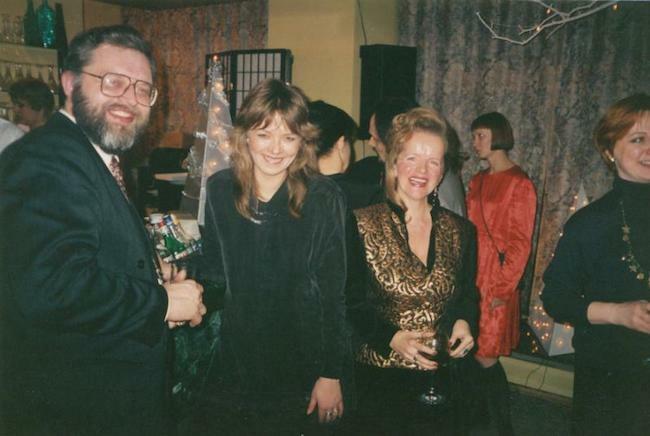 At that time Daira Silava, manager of Model association, came up to me and invited me to join a model agency. That shocked me even more! So, I slowly stayed at Café Osiris, and I see that its clientele has hardly changed. When I lived nearby for some period of time – on Blaumaņa street, Cafè Osiris was the first place for me to come to, even before the morning shower. When I lived in Amsterdam for two years, I didn’t miss anything from Riga as much as this café. Nothing much has changed in Cafè Osiris during these twenty years; and if it changes, then slowly and carefully. Maybe only the staff has changed more rapidly over the last years… Up until now, if a new employee came, he was slowly introduced to the café’s atmosphere, but if all of them are new… Kind of unfamiliar and strange, but, actually, we are starting to get used to it. To be honest, I don’t even remember the beginning of the relationship between me and Cafè Osiris… I just know, that I am even more often there now, than I was before. I have my own favourite foods there, my favourite drinks and my favourite spot. I know that I can always meet Mr. Vilipsōns there, talk to him, see his works. It is truly a place where you want to go back to, as it gives you a feeling that you are welcome there. By not changing its interior and its menu, not changing its clientele, it hasn’t lost a bit of its charisma, on the contrary – it has become more valuable – and it has gained a legendary status. For me personally Cafè Osiris means coming into artistic environment and remembering my own life’s mission. The first few times I came here I had lunch with my mother’s cousin Jānis Borgs. Now it is a place where I meet my friends, and sometimes in between us we call this café a “sanctuary”. So we have been meeting up in our sanctuary since the late ‘90s. It is a place for simple meetings – lunch and dinner, and it has also been a place where the most random projects were born. Yes, very many indeed! I remember when Cafè Osiris opened up, we went there to eat Greek salad, which was then a real discovery! Cafè Osiris… it is a place where you can feel at home, there is no other place like that in Riga! It is a place where you can always meet some interesting people. I meet my fancy friends there and we always know for sure, that we will go to Cafè Osiris. There are many new places, but somehow I am not attracted to them… I know for sure – I will always get some dose of peace and happiness in Café Osiris, as well as good food and honest attitude. It is an elegant place, but you can also have a great conversation and laugh until you fall! At the moment the stuff, as well as the menu have slightly changed… it was kind of cool, when these were constant things there. For me Cafè Osiris is a Latvian culture institution, which goes hand in hand with Andrejs Žagars’ taste, personality and ambition. It is a place which is both fancy and democratic at the same time, both as home and a place to meet people at the same time. There has never been a time when there were no acquaintances there. The wonderful actors of The New Riga Theatre come here, as well as Māris Sirmais, Dāvis Sīmanis, Uldis Tīrons and many others. My Jackie (Jack Russell Terrier) has her own pillow there to sleep on. Cafè Osiris always has potatoes, herring and cottage cheese. And chicken liver with new potatoes, bacon and iceberg lettuce. And porridge, omelette and a big coffee cup with milk for breakfast. Cafè Osiris is a historic place in Latvian culture. In the ‘90s some important Soros Foundation decisions about culture were discussed here. 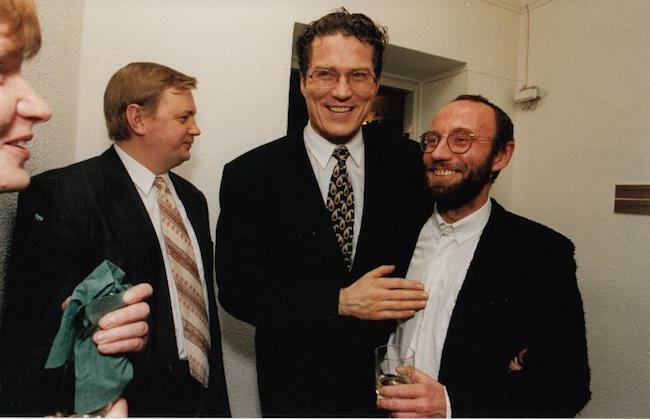 In 1996 on the couch next to the bar counter, I, being an advisor to the Prime Minister, persuaded Andrejs Žagars to become General Director of the Latvian National Opera. In 2005, already in another position, for three hours I persuaded Ojars Rubenis to become General Director of the National Theatre of Latvia. In the mid ‘90s I had meaningful discussions with Alvis Hermanis here – when he wasn’t so famous and busy yet. But also this year – on a warm evening of May, Alvis, Andris Vilks and me, we were solving the most global possible problems. 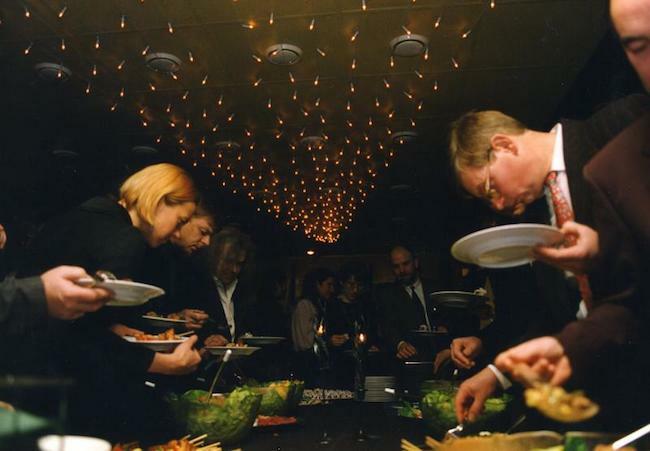 There have been numerous International experts’ commission lunches (of future Museum of Contemporary Art). In the last few years, there have been some constructive discussions with Mareks Indriksons, Manager of The Boris and Inara Teterev Foundation, which resulted in the program “Art in Public Space”. However, my most unforgettable experience is the opening of the Latvian National Opera after its reconstruction – in the fall of 1995. I love opera no less than Andrejs Žagars does. That night he wasn’t here. But I, together with five more people related to the Soros Foundation, was dancing on Cafè Osiris’ tables in my lace shoes at five o’clock in the morning. I was so happy that Riga had its White House again!! !